Ben Cruachan over her left shoulder and Lock Awe in the distance. Heather has worked with children for over 30 years as a speech therapist. Her understanding of children, combined with her love of animals, especially dogs — and most especially her own dog Ian, the border collie who inspired this story — helped to create "Tails" of the Collie Lama™. 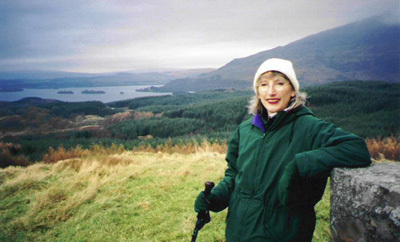 Heather and her husband John live in Georgia, but both have a special love in their hearts for the "heather-laden hills of Scotland". This book started as a story about an agility dog who thought she had to herd sheep. Then my husband John suggested, "Why not write a story using the name 'Collie Lama'?" That was the spark that started the creative process. I wrote "Tails" of the Collie Lama™ in the summer of 2002. Each evening after a full day at work, I sat down at my computer in the quiet of the night in my home office with our dog Ian by my chair and started typing the words to this story. Before I started to type, I would look out my office window, up through the trees and into the night sky and say, "Okay, Lord, what do you want me to say tonight?" Thus this book was truly a Divine Collaboration. Ian, normally very active, would lie quietly at my feet as I typed until I was finished with what I was meant to write that night. Over my long career I have encountered many children who have come from as many backgrounds as one could imagine. I've worked with children who were highly intelligent, mentally challenged, outgoing, shy, confident, unsure of themselves, cherished by their parents, and even a few who have been abused by family members. Several personality types have resonated with me, particularly those lacking in self- confidence. I feel the wisdom of the Collie Lama™ - "Take care of yourself, be true to yourself, think for yourself" - needs to be shared with these children and all the children of the world. My dear friend Dr. Betty Brittain, former Principal of East Clayton Elementary School (where I taught for many years), gave me these words in the beautiful epistles she shared with friends and family after she retired. So, as with many projects, there was not just one event that started the process. It was a combination of incidental comments, a stray idea or two, deep relationships, persistent effort, and God's love that led to the creation of this work. I hope you will enjoy the book and that you will find the hidden heart in each illustration.